As TJC expands its territory throughout East Texas, the Board of Trustees saw fit to give Dr. Juan Mejia, District Provost and now President of Branch Locations. In this new role, Dr. Mejia will oversee the outside campuses that TJC owns across East Texas, like TJC Rusk, TJC, Jacksonville, TJC West in Tyler, TJC North in Lindale and TJC’s Online Virtual Campus. As this new role begins for Dr. Mejia, he defines TJC as a “powerhouse of higher learning,” and sees to expands the beauty and the feeling of our main campuses to our other campuses. Dr. Mejia sees that in the near future, other Junior Colleges can look at TJC and see how, he, along with Chancellor Metke, Board of Trustees, faculty, staff and students reinvented Junior Colleges. Even though it seems like a lot of time and work, Dr. Mejia admitted that his mindset will remain the same. 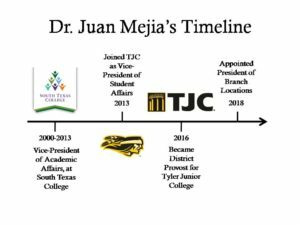 Times have change for Dr. Mejia, and he plans to use his “Meela Method” to make TJC a world class institution of higher learning. Dr. Mejia worked for the South Texas College, as the Vice-President of Academic Affairs. There, he worked to expand South Texas College where he played a similar role that he will be playing now as President of Branch Location. 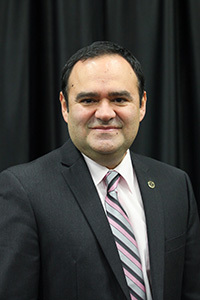 Dr. Mejia arrived to TJC in 2013, as Vice-President of Student Affairs, and since then, it has been non-stop for his dedication, as in 2016, he became the 1st hispanic District Provost, and now President of Branch Locations. Dr. Juan Mejia sounds like he can handle the responsibility of this position. This promotion will probably help TJC manage its additional campuses. What are some of the goals planned for “reinventing”?